Background: I've been using InDesign since version 1.0 jumping away from PageMaker and Quark 3.0. My studio uses InDesign six days a week and builds publications from one page to 50 regularly. I'm going to document my test of Affinity Publisher, and I would be interested in how it is going for other studios. Is anyone planning on making the switch before the beta ends? My reasons for looking at alternatives are price and cloud integration. Adobe increased the CC subscription price. Stinky, but what bothers me more is the constant need to integrate the cloud. Every day I wait for the InDesign font-sync to load. Grab a coffee and cookie. Before that was active hyperlink checking. It's a constant problem. My Adobe subscription renews in three weeks. Perfect time for a serious workflow test. 14 page document test. Quickly learned that layers aren't right, but found out that layers will be adjusted in future versions. Typesetting a quick color form. No layers. 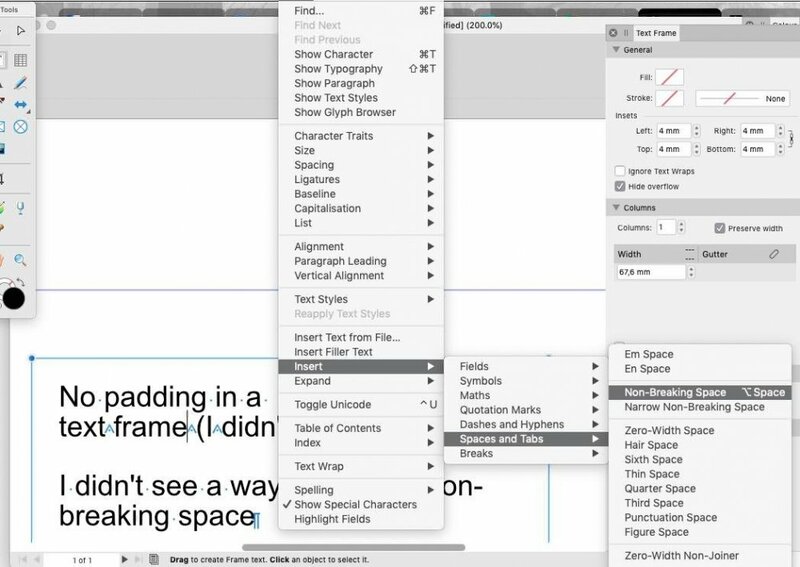 Clip to canvas (love it; some of us like to use preview in InDesign. Some like regular view. This is a happy medium). Is anyone planning on making the switch before the beta﻿ ends? I wonder who with a serious business would take that risk. It's a beta! I'm willing to take that risk. It worked out when I switched to InDesign years ago. Am I going to build a huge publication in Publisher? No. Will I finish today's form and send to my client for review. Yes. Yeah, I just ordered a 80+ page photobook with more than 200 photos. I consider that a huge publication. I put it to a real stress test, but sadly it failed half way due to memory and stability issues. To continue my work I had to do workarounds like rasterize everything to reduce stress to it. If I would have a business I would not trust Publisher right now. It is just not ready. But take the risk if you think so. I'm one of those who have stuck with Adobe CS6 all these years to avoid the trap of the Adobe CC subscription model (the threat of an arbitrary rise in monthly fee; threat of losing access to one's own work if one ever ends subscription). It's Apple's move to an all 64 bit OS X that has really motivated me to take a serious look at the Affinity suite to replace Illustrator, Photoshop and InDesign. The Adobe CS6 software is 32 bit only. The Affinity software is already built as 64 bit software. So far, I'm favorably impressed by the Affinity tools. It seems that the Affinity suite may be my way out of the Adobe subscription trap. The only nagging thought I have is whether or not I'll be able to use the Affinity suite exclusively in my own practice. A lot depends upon Affinity's ability to import and export the Adobe file formats, since clients and collaborators often assume the ability to exchange Adobe files back and forth in a collaborative workflow. If one can work within a bubble and control the entire workflow in-house, moving over to Affinity is a no-brainer. But I don't work within a production bubble, and so I'm afraid I may have to finally succumb to subscribing to the Adobe CC suite and build the monthly fee into my pricing. How are you guys planning to manage this problem? Better yet, how is Affinity planning to help the design community get beyond the file exchange problem? If they can solve that problem, designers will abandon Adobe in droves. ...clients and collaborators often assume the ability to exchange Adobe files back and forth in a collaborative workflow. It's been an age since I sent native InDesign files to a print vendor. Nearly all of the print vendors I work with regularly just want a hi-res pdf with fonts embedded. I haven't tested it yet, but Publisher looks to have the right settings for a print pdf. Same for Illustrator. I've always sent EPS files when needed because of AI version problems. At the Publisher price point, I may ask my regular contractors to use Publisher too. Staff certainly will get their own copy. There's a few threads already about file exchange between InDesign and Publisher. It looks like they are reviewing ways to work with the idml file. If successful, that works for me. We already use the idml file for clients who have older versions of InDesign. I have Adobe CS4. When I migrated to a new iMac is stopped working and Adobe are no help. hence my total switch to Affinity. I was asked to translate a German language text book into English but there are a lot of annotated illustrations so I decided to do the whole thing in AP. Last week it stopped working but I quickly realised that it was iMac memory problem, 16Gb was not enough for really big book. Only option, new Mac, which I got and now working fine. This book is big, I mean really big, 500Mb with embedded pics and illustrations. It is still not finished but two weeks ago I sent a print PDF of it to a one off book printer. It was absolutely fine. Apart from typos, no issues at all. The indexing is not working properly. If you update the it, all the formatting is lost but that is recoverable. To be honest I had hoped that a release of AP would happen before printing but I guess not. My fall back position would be to send a pdf to an InDesign person in India or somewhat to turn it into an ID file but that looks increasingly unnecessary. FYI, the origination for the German language version was provided to me as the original print PDF. I opened it in AP and was able to extract all the data for translation that way. Hope that this helps. Affinity and the forums are really great, a real sense of community. Hey, Roger. Thanks so much for your feedback. It's very encouraging to hear stories like yours, and I'm hopeful that the Affinity team can bring all this home for a big win – for them and for us. My biggest worries are not so much with delivering files to printers, but in being able to exchange working files back and forth with clients and collaborators who are invested in the Adobe suite. Affinity Photo is in the best position to roundtrip Photo/Photoshop files. Designer can import Illustrator files, but can only output PDF files in return, and then the layer structure is lost. I'm hoping that Publisher will be able to import and export InDesign IDML files. Best of luck with your big book. Yep. That's the solution to those two problems. And the Text Frame panel is accessed from the View > Studio > Text Frame menu item. To be absolutely and perfectly honest, until this project I had never used AP and had only a limited limited knowledge of InDesign so the learning curve has been very very steep. I am almost at the end (3 months work) but still have issues which, incidentally, were not fixed by the new iMac with 32GB ram, I am very disappointed, to the point of returning it to the shop. One thing I have discovered is that the best way to handle the graphics which had been produced in VISIO was to export them to AD and save them as pdf's. Really low size and still editable when imported into AP. I have just found a new problem. Attaching a text wrap to a graphic now locks the system completely. It never did that before. I am almost at the end (3 months work) but still have issues which, incidentally, were not fixed by the new iMac with 32GB ram, I am very disappointed, to the point of returning it to the shop. You want to return a computer because a beta software is failing on it? Publisher Beta 206 becomes unstable and unrealiable after a certain project size. For me with 16 GB of memory ut's after having 200 high-res images in the project. Other people with more memory can go further until problems arise. Even if they seem to have trouble finding the cause of the problem I'm confident it will be fixed eventually. So right now you can do small projects with it and that is enough to spot bugs to report and share your experiences. This is what is all about. I don't like Apple at all, but even I think it's unfair to return a perfectly working computer because you want to use a beta software unsuitable for production use for production. If I was the shop owner and knew that I would decline taking it back. 32 GB memory is surely better than 16 GB but I think Serif has to tune Publisher to handle huge projects even with 8 GB memory. Yes, it may run slower because of caching to disk or you may have only low resolution previews, but it should be possible and never crash! I suspect the not really linking files but having everything always embedded to be the cause of the problem. @Michail told me that InDesign handles large files, but has true linking. This may be a current design flaw in the file format. No, the overall performance is not much better than my 2012 iMac with 16Gb ram. Though of course it does have a retina screen which is better for sure. I think this new mac has less of one kind of ram, but I don't remember the specs. The new Mac Mini is definetely far better than the old one! At my day work I develop an iPad app and I recently switched from Mac Mini i5 2012 to the current model and as Apple promised the XCode compilation time dropped from 15 minutes to 7. Therefore I see their advertising of 2.2x system performance as fulfilled. As my app is cross platform I have also a Windows 10 machine with quite similar specs which runs snoother. So there still may be a MacOS problem that makes working feel a bit sluggish in comparison. But as you don't switch back and forth between Mac and PC you won't notice that. So you may want to compare the specs of the new Mac Mini to your iMac. If they are similar I don't see your point and otherwise you may want to test that thing. Day 3: Quick form typesetting. Sent form to desktop Xerox postscript printer without errors.